The group of seven Americans awarded the nation's highest civilian honor also included baseball great Babe Ruth and retiring Sen. Orrin Hatch, R-Utah. 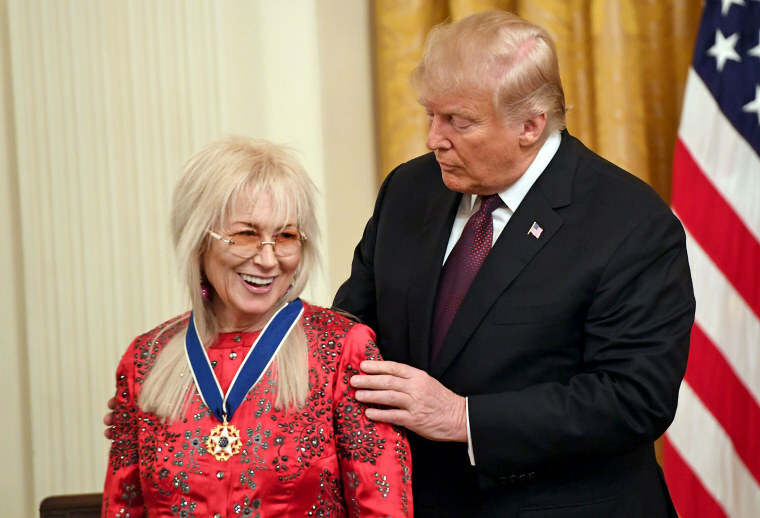 WASHINGTON — President Donald Trump on Friday presented seven people with the Presidential Medal of Freedom in a White House ceremony. The medal, the nation’s highest civilian honor, is awarded at the discretion of the president to people who have made a significant cultural impact or great contributions to the U.S. or the world. This class of honorees included Miriam Adelson, wife of GOP mega-donor Sheldon Adelson and a major donor in her own right; Sen. Orrin Hatch, retiring Republican senator from Utah; and two NFL Hall of Famers, Alan Page, who served on the Minnesota Supreme Court after his playing career, and Roger Staubach, who served in the Navy before his. Three other recipients were awarded the medal posthumously: Supreme Court Justice Antonin Scalia, Babe Ruth and Elvis Presley. As a couple, the Adelsons donated $30 million to aid the president’s 2016 campaign effort, later giving $100 million to GOP efforts in the 2018 midterms. Trump made no mention of Adelson’s political involvement Friday, highlighting her medical career as well as her support for Israel and various Jewish organizations. Trump is not the first president to award the medal of freedom to political backers. In 2013, President Barack Obama awarded the medal to Oprah Winfrey and Bill Clinton, among others. Winfrey and Clinton both actively campaigned for Obama during his 2012 re-election campaign, with Winfrey donating the maximum individual amount allowed. While honoring Hatch, Trump mentioned his role in last year's tax cut legislation. As chairman of the Senate Finance Committee, Hatch was instrumental in getting the Republican tax reform bill through Congress, giving Trump one of the biggest wins of his administration. Scalia’s wife, Maureen, accepted the medal on her husband’s behalf. Page, who is black, has been a vocal critic of the president, saying the administration has “played to people’s racial insecurities.” In an interview with The St. Paul Pioneer Press this week, Page said he would accept the medal and use the honor to try to make the world a better place.